Introduced and invasive species can present big problems, particularly when those species are charismatic, finds a recently published paper in the Ecological Society of America’s journal Frontiers in Ecology and the Environment. People tend to have a more favorable view of species that are large; do not bite, crawl, or squirm; are not oily or slimy; or are culturally valued. Some introduced species, like zebra mussels, tend to be reviled by the public, and people willingly adhere to strict management policies. However, if an animal has that elusive quality of charisma, people often don’t want it to be controlled, even if it’s harming the environment. Inevitably, these imbalances in public perception of introduced species influence the way those organisms are managed. Ring-necked parakeets and feral domestic pigeons both frequent some urban areas in the UK, and people have grown used to seeing them in their local parks. Photo courtesy of Loz Pycock. Take the ring-necked parakeet (Psittacula krameri) for example. The pet trade has led to an established population of parakeets in Europe, far outside the species’ native range. Even though parakeets can transmit diseases to native birds, compete with them for nesting cavities, and are recognized as a crop pest, the public enjoys seeing them in parks, gardens, and homes. Introduced parakeets tend to be released in cities, but the parakeets actually exact the most damage in rural areas. But because people have grown used to them, they are likely to oppose eradication efforts that take place before the birds become an established nuisance. Opposition to the management of charismatic species can be exacerbated by these “social–ecological mismatches” – differences between the scales of interacting social and ecological systems. In the parakeets’ case, the introduced birds have not been around for more than a few decades, which is not a long time on an ecological scale. But it is long for humans – many have grown up knowing the parakeets are part of their neighborhood, and so oppose efforts to manage them. A group of researchers from the US Geological Survey (USGS) and universities in the US and UK explored how public perception and management actions toward charismatic, introduced species are often at odds with the ecological characteristics of these populations. The paper argues that scale – and specifically for mismatches of scale between social and ecological systems – is a key influence on many conflicts involving introduced-species management. In a nutshell, the average citizen or policymaker experiences things in “human time” while ecosystems and introduced species experience things in “ecosystem time.” The same goes for differences in spatial scale; humans experience things on a human scale – their neighborhood, their city, things at the level of their own experience – while ecosystems and invasive species have more far-reaching consequences that are tough for people to comprehend. This makes it difficult to enact policies that are in line with the way ecosystems behave and species invasions occur. The researchers explore other cases of introduced species and suggest ways to establish science-based strategies for managing them while also maintaining public trust. Horses have been integral to human life throughout history, and hold widespread cultural significance. But horses are not native (at least in the modern era) to many of the places where they currently roam. Photo courtesy of Steve Petersen. Free-roaming horses (Equus caballus) are another example. Horses have been integral to human life throughout history, and hold widespread cultural significance. But horses are not native (at least in the modern era) to many of the places where they currently roam, and many of their populations have high growth rates. Some nations, like Australia, cull their wild horse populations in an attempt to control grazing impacts on indigenous plants. In an Argentinian provincial park, wild horses have reduced native plant cover and allowed invasive pines to gain a foothold – a result that conflicts with the park’s fundamental management goal of preserving the native grasslands. In the US, there are nearly three times as many horses on rangelands than the Bureau of Land Management (BLM) has said is appropriate. One of the more socially acceptable management practices is to relocate them to holding facilities, but these can be overcrowded and take up a considerable portion of BLM funding. Lead author Erik A. Beever of USGS explains that, as with the parakeets, social and ecological scales are at odds with each other for these iconic mammals. Management approaches can be standardized at the state or national level, yet the differences in how horses’ influences play out in nature illustrate the importance of locally-relevant approaches. “Horses can move very far,” he said, “but their management areas can be small and the boundaries do not shift over time or account for seasonal movement.” Additionally, management decisions and projects may take months to years to come into effect, while natural events can shift horse populations in days or weeks. These differences in the scales at which social and ecological systems interact with introduced species create multi-faceted management and conservation challenges. However, Beever and his colleagues hope that shedding some light on this fundamental problem will aid management tactics in the future. The Ecological Society of America, founded in 1915, is the world’s largest community of professional ecologists and a trusted source of ecological knowledge, committed to advancing the understanding of life on Earth. The 9,000 member Society publishes five journals and a membership bulletin and broadly shares ecological information through policy, media outreach, and education initiatives. The Society’s Annual Meeting attracts 4,000 attendees and features the most recent advances in ecological science. Visit the ESA website at http://www.esa.org. During the night, this caterpillar (Oxytenis modestia) moved onto and began feeding on a leaf directly above the nest of a rufous-tailed hummingbird (Amazilia tzacatl), whose comings and goings disturbed the caterpillar, causing it to expand and reveal its “eyes” and rear up into its snake-mimic posture. Photo courtesy of James Marden. When a caterpillar disguises itself as a snake to ward off potential predators, it should probably expect to be treated like one. This is exactly what happened in Costa Rica earlier this year, when researchers witnessed a hummingbird defending its nest from what it interpreted to be a snake, but was actually a larva of the moth Oxytenis modestia. The encounter is described in a new paper published in the Ecological Society of America’s journal Ecology. These moths — sometimes called the dead-leaf moth or the Costa Rica leaf moth — resemble flat dried leaves as adults. The caterpillars can inflate the top of their heads to expose a pair of eyespots. When disturbed, they raise their head up and move from side to side, increasing the snake-like appearance. In particular they resemble a green parrot snake, known to prey on nesting birds. The attacking hummingbird’s nest with eggs was about 10cm away from the caterpillar in a small tree. When the researchers went to look for an assumed snake, they instead found the caterpillar feeding on a leaf immediately above the nest. Caterpillars and adults of a variety of butterflies and moths have eye-like spots that deter potential predators. Observations of how these eyespots affect animal interactions in natural settings are extremely rare. The interaction took place on a strip of secondary growth between the Pacific and primary rainforest on the Osa Peninsula, Costa Rica. The authors believe that the comings and goings of the female rufous-tailed hummingbird (Amazilia tzacatl) around its nest may have disturbed the caterpillar, causing it to expose its eyespots, which in turn prompted the hummingbird to defend its nest using what is referred to as ‘mobbing behavior’ by birds — darting flights and pecking at a threat, commonly snakes. The caterpillar was unable to feed during the 26-minutes of nearly continuous attacks. Most of the bird’s movements were cautious and exploratory, but included quick thrusts to peck or bite the eyespots (view video clip here). A bite directly on the false eye. Photo courtesy of James Marden. Eventually the caterpillar gave up on eating and crawled away while still under attack, and the hummingbird resumed normal nesting behavior. When birds exhibit this mobbing behavior targeting snake’s eyes, it often ends with snakes being killed by repeated bites and pecks near the head and collar area. As for creatures that mimic snakes to protect themselves from being eaten, can they in turn protect themselves from this mimicry backfiring, such as in this encounter? Because the hummingbird behavior was typical anti-snake behavior, it can be considered replicable. Marden is fascinated by this interaction, and he believes future studies of this behavior can be conducted using a tiny, caterpillar robot to experiment with eyespots. When disturbed, the caterpillar increases its internal pressure, causing the area behind the head to expand and expose a pair of eyespots. Expansion and exposure of the “eyes” is accompanied by rearing up and side to side movements, which closely mimic a small snake. Photo courtesy of James Marden. With such a robot, researchers could vary the eye-like nature and contrast of spots on the head of the robot to test various responses of nest-defending birds. A study like this could definitively test the effects of eye-like versus other mimicry patterning for provoking or repelling defensive attacks. The day following the initial encounter, the researchers found the caterpillar feeding on a leaf on the same plant, as far away from the nest as possible. It had some marks by the edge of the right eyespot that may be beak marks – apparently the caterpillar learned its lesson. The Ecological Society of America (ESA), founded in 1915, is the world’s largest community of professional ecologists and a trusted source of ecological knowledge, committed to advancing the understanding of life on Earth. The 9,000 member Society publishes five journals and a membership bulletin and broadly shares ecological information through policy, media outreach, and education initiatives. 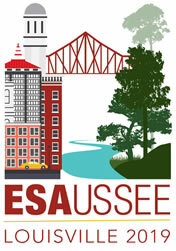 The Society’s Annual Meeting attracts 4,000 attendees and features the most recent advances in the science of ecology. Visit the ESA website at http://www.esa.org. Is biodiversity bad for your health? Ecologists writing in ESA’s open access journal Ecosphere say the opposite is more likely true. The specter of a dangerous new disease emerging from the dark depths of the wilderness, jumping from an animal host to people, is an oft-told horror story, though such “spillover” from wild species is not the most common mechanism through which new diseases emerge. Several recent reviews have expressed concerns that intact ecosystems rich in biodiversity pose a danger to human health by harboring an equal diversity of infectious disease agents. Animal species do not present an equal threat of disease transmission, however, say Richard Ostfeld and Felicia Keesing, ecologists at the Cary Institute for Ecosystem Studies and Bard College. Some families, such as rodents, transmit disease relatively commonly, while others never do. People most often contract zoonotic disease from rodents encountered near houses or agricultural fields. The authors review the evidence for emerging disease risk in both relatively intact, functional ecosystems and ecosystems strongly affected by human presence. Though high diversity in vertebrate species is sometimes correlated with a wider total pool of pathogen species, biodiversity is not linked to a larger number of pathogens with the potential to leap between species. Solid evidence does point to a correlation between biodiversity and lower prevalence of known infectious disease in people. The authors argue that there is no reason to expect that biodiversity is a risk factor for disease emergence and offer possible experiments to test their hypothesis empirically. Grazing ecosystems from the arctic tundra to tropical savannas are not smooth expanses but fine-scale patchworks of lawn, favored by big grazing animals, and taller vegetation. Ruth Howison and colleagues at the University of Groningen and the royal Netherlands Institute for Sea Research are interested in the environmental processes underlying the mosaic. They look to the soil in a new report in ESA’s journal Ecological Monographs. Compaction of soil under the hooves of heavy grazers promotes lawn communities. Underground animals churn the soil, engineering conditions that favor taller plant life such as bunch-forming grasses, herbs, and shrubs. Control of agricultural pests by their natural predators saves an estimated $627 per hectare of cropland annually. Abetting these natural crop protectors is of interest to economists and ecologists. But some pest-eating insects have their own predators, Ingo Grass and colleagues at the University of Göttingen point out in ESA’s journal Ecology. During peak aphid season, European tree sparrows fed their nestlings a diet of 77 percent hoverflies and ladybugs (ladybird beetles). Hoverfly caterpillars are the most abundant aphid predators. When the birds were not around (thanks to protective nets set up by experimenting ecologists), aphid density fell by 24 percent in wheat fields and 26 percent in oat fields. How do grazing livestock affect their greater sage-grouse neighbors in Wyoming’s sagebrush country? Positively or negatively, depending on the amount of grazing and when grazing occurs, according to research published in ESA’s journal Ecological Applications by scientists from the U.S. Geological Survey (USGS), Colorado State University, and Utah State University. Higher levels of grazing occurring early in the growing season – that is, before peak plant productivity – was associated with declining sage-grouse population trends, whereas similar levels of grazing that occurred later in the growing season corresponded with sage-grouse population increases. Scientists often use artificial breeding sites such as nest boxes, bat houses, and human-made burrows to study and manage numerous species of animals including bats, insects, lizards, fish, and birds. The addition of human-made nest sites to an ecosystem does not always benefit populations or help researchers to monitor species, such as the American Kestrel, which regularly use nest boxes, ecologists from The Peregrine Fund’s American Kestrel Partnership (AKP) and the Department of Biological Sciences and Raptor Research Center at Boise State University warn in ESA’s journal Ecological Applications. Invasive species management often generates social conflict. Sarah Crowley and colleagues at the University of Exeter consider why some management approaches may be more prone to conflict than others and offer approaches for anticipating disagreements, communicating, and including local communities in ESA’s journal Frontiers in Ecology and the Environment. The Ecological Society of America, founded in 1915, is the world’s largest community of professional ecologists and a trusted source of ecological knowledge, committed to advancing the understanding of life on Earth. The 10,000 member Society publishes five journals and a membership bulletin and broadly shares ecological information through policy, media outreach, and education initiatives. The Society’s Annual Meeting attracts 4,000 attendees and features the most recent advances in ecological science. Visit the ESA website at http://www.esa.org. American crow (Corvus brachyrhynchos), with Cheeto. Jackson Hole, Wyoming. Credit, Rhea Esposito. Black-billed magpies and American crows, both members of the clever corvid family of birds, have adapted comfortably to life in urban and suburban communities. In Jackson Hole, Wyoming, the two species often nest nearby each other in backyards and parks. Nesting near their much larger crow cousins affords magpies a margin of extra safety from a common enemy—ravens, an even larger corvid species. “Ravens are notorious nest raiders,” said Rhea Esposito, an educational program leader at the Cary Institute of Ecosystem Studies. During her doctoral work at the University of Louisiana at Lafayette, Esposito studied how birds associate during nesting season. Smaller birds sometimes nest near larger species to benefit from their more aggressive defense against predators. Research has tended to focus on the protection side of the relationship. But what about competition? Do magpies pay a food penalty for nesting near larger rivals? Or do the smaller birds compensate with bold pursuit of new food sources? To find out which of the two corvids were more intrepid snack scouts, Esposito presented breeding pairs with a set of Cheetos challenges. She will present her results today at the 101st Annual Meeting of the Ecological Society of America in Fort Lauderdale, Florida, during a session on animal Behavior. Esposito set out Cheetos near nests and settled in to watch the birds fly down to investigate. Magpies moved on the unfamiliar food an average of 20 seconds faster that crows, which eyed the orange treats with more suspicion, pausing longer before picking them up. Once having identified Cheetos as food, however, crows were more apt to steal. “Because it’s the nesting season, they are often close enough to see neighboring Cheetos piles. So crows would learn that there is food at the nearby magpie nest, as well as their own nest. Crows steal more often than magpies by a factor of three,” said Esposito. Esposito raised the level of difficulty through several tests, ultimately hiding the Cheetos inside a hollow log. To extract the cheesy reward, the birds had to pull on a string. “It was a really fun experiment…just a blast to watch,” said Esposito. Magpie explores a Cheeto puzzle from Ecological Society of America on Vimeo. Magpies were bolder puzzle solvers as well, earning their Cheetos about a minute faster than crows, on average. “These puzzles were very simple for corvid abilities. They have solved much harder problems in the lab. But this was one of the first such experiments with wild birds and I was more interested in the ecological than the cognitive questions,” said Esposito. American crow pokes a suspicious Cheeto puzzle experiment in Jackson Hole, Wyoming from Ecological Society of America on Vimeo. Black-billed magpie (Pica hudsonia) , Jackson Hole, Wyoming. Credit, Rhea Esposito. To follow up on the discovery angle, Esposito staged Cheetos between nests, placing them an equal 85 meters from the nesting crow and magpie pairs. Contrary to her expectations, crows and magpies made first discovery of the food piles at equal rates, and with equal speed. But she noted a familiar pattern. Crows appeared to use magpies as Cheetos scouts, waiting for the smaller birds to explore the food, then landing and shooing the magpies off their prize. Over time, magpies gave up on getting anything and wouldn’t even land. Crows were braver when stealing, showing less vigilance for potential predators in the presence of others than when approaching food alone, perhaps because the magpies had already proven the area to be safe. But the crows may simply have been hustling to grab the loot. “Crows are about twice the size as magpies—that’s why they are great as nest defenders. But there is a cost,” said Esposito. The magpies’ boldness in seeking out new foods did not, in the end, net them more meals. Esposito has evidence that magpies do gain protection by nesting near crows, but choosing crow neighbors does not improve their overall success at producing offspring. She suspects that the cost in lost food opportunities balances the greater safety offered by the proximity of the bigger birds. Figuring out that balance is a question for future snack research. The Ecological Society of America, founded in 1915, is the world’s largest community of professional ecologists and a trusted source of ecological knowledge, committed to advancing the understanding of life on Earth. The 10,000 member Society publishes six journals and a membership bulletin and broadly shares ecological information through policy, media outreach, and education initiatives. The Society’s Annual Meeting attracts 4,000 attendees and features the most recent advances in ecological science. Visit the ESA website at http://www.esa.org. New Brunswick family helps remove invasive snowshoe hares from a group of remote Bay of Fundy Islands, five decades after introducing them — and other highlights from the February issue of Frontiers in Ecology and the Environment. Too much of an adorable thing. 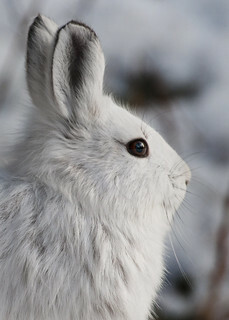 Snowshoe hares like this one, photographed in its winter finery in Denali National Park, are native to North America and range across the north of the continent from Alaska to the coast of Maine, but had not colonized the remote islands of the Bay of Fundy, 15 miles off the coast of Maine, without human help. Credit, NPS Photo/ Tim Rains. Nathaniel T. Wheelwright (2016), Eradication of an ecosystem engineer. Front Ecol Environ, 14: 53–54. doi:10.1002/fee.1221 (open access). Snowshoe hares arrived on tiny Hay Island, at the mouth of the Bay of Fundy, in 1959, traveling by boat from Grand Manan Island, New Brunswick, Canada, with Wesley Ingalls and his nephew, Junior. The two fishermen had the idea that trapping hares would make an entertaining winter activity, when they were not fishing, and bring in a little extra money. With no competitors and few predators, Ingalls’ original dozen hares quickly became several hundred. When low tide opened a causeway to neighboring Kent Island, they hopped across. Junior went out to Hay two years later to harvest young balsam firs for his herring weir, as was his custom. The forest stand never grew back. A bramble of wood fern and raspberry grew up in its place, crowding out other plants and providing excellent cover for bunnies hiding from bald eagles and wintering snowy owls. Snowshoe hares are native to North America and range across the north of the continent from Alaska to the coast of Maine, but had not colonized the remote islands of the Bay of Fundy, 15 miles off the coast of Maine, without human help. On Hay and Kent their population reached 3-50 times the density of hare populations on the Maine mainland. They had an impact. Intrepid eaters, the hares mowed though young saplings as well as grass. In winter they even climbed the bases of trees to gnaw on twigs and bark. As mature trees aged and blew down in storms, no young trees grew to replace them. The hares bonsaied surviving young spruces into the shape of alpine cushion plants. For nearly five decades, the hares shaped the vegetation of Hay and Kent islands. Ingalls had unintentionally initiated and ecological experiment by introducing a keystone herbivore to the island. Kent island also happens to house Bowdoin College’s biological field research station, originally established in 1930s as a preserve for the then near-extinct common eider (Somateria mollissima). In 1998 Nathaniel Wheelwright, a professor at Bowdoin and then the director of the Bowdoin Scientific Station, set out to eradicate the snowshoe hare with the help of Junior’s son and grandchildren. The hares came back. They tried again 2002, with additional recruits from Maine and New Brunswick, but failed again. Wheelwright decided he needed help from the experts. He emailed the chief of New Zealand’s national pest control agencies, who replied, “Eradicating the hares using hunters and dogs from 70 ha ought to be trivial. You’re not trying very hard.” The team tried harder, and in 2007, succeeded in removing the last hare. Now, Bowdoin’s Scientific Station is observing the experiment in reverse. A think carpet of tree seedlings covers the forest floor. The trees are so successful in recolonizing open fields that they threaten the breeding habitat of the islands’ savanna sparrows, under observation by the station since the 1960s.. In an ironic twist, station biologists will have to mow fields to hold back the resurgent forest and preserve a long-running study from the era of the hare. Large national parks that are home to gorillas, chimpanzees and other great apes are focal points for much of the field research on biodiversity conducted in tropical Africa and Asia, resulting in crucial knowledge gaps and a biased view of broader conservation needs in those regions say anthropologist Andrew Marshall colleagues. Scientists tend to place field studies in large protected areas that house our primate relatives, leaving a third of African protected areas with no research attention at all. Full press release from the University of Michigan. The power of modern technology has made it possible to transport the benefits of ecosystems for human societies (ecosystem services) far from the source. Jianguo Liu and colleagues examine the consequences in a very dramatic example, China’s enormous South-North Water Transfer Project, designed conduct water from the Yangtze River basin hundreds of miles to three parched regions in the north. Construction began in 2002 and is expected to take 50 years. Though the water will flow with gravity on the Central route to Beijing, the Eastern route to the North China plain must flow uphill and tunnel under the Yellow River. The proposed Western route must pass the Bayankala Mountains. Liu and colleagues propose that natural cause-and-effect feedback from the environmental consequences of the water diversion, disconnected by distance, may be replaced by information flows between sending and receiving locations, in the form of news, science, and protest movements. 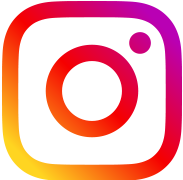 The Ecological Society of America (ESA), founded in 1915, is the world’s largest community of professional ecologists and a trusted source of ecological knowledge, committed to advancing the understanding of life on Earth. The 10,000 member Society publishes six journals and a membership bulletin and broadly shares ecological information through policy, media outreach, and education initiatives. The Society’s Annual Meeting attracts 4,000 attendees and features the most recent advances in ecological science. Visit the ESA website at http://www.esa.org. Frontiers in Ecology and the Environment, issued 10 times per year, consists of peer-reviewed, synthetic review articles on all aspects of ecology, the environment, and related disciplines, as well as short, high-impact research communications of broad interdisciplinary appeal. Tucked away from judging eyes, backyards are unexpected treasure troves of resources for urban birds. ESA Centennial Annual Meeting, August 9-14, 2015 in Baltimore, Md. Many of us lavish attention on our front yards, spending precious weekend hours planting, mowing, and manicuring the plants around our homes to look nice for neighbors and strangers passing by. But from the point of view of our feathered friends, our shaggy backyards are far more attractive. Is a robin eating backyard pokeweed berries a welcome visitor or weed-spreading nuisance? Credit, C. Whelan. So found ecologist Amy Belaire when she surveyed human and avian residents in 25 Cook County neighborhoods in suburban Chicago. She will present her research during the 100th Annual Meeting of the Ecological Society of America on August 9–14, during a session on Urban Ecosystems that also includes Caroline Dingle’s observations on how birds modulate their songs to be heard over the noise of daily life in Hong Kong, and Kara Belinsky’s exploration of how many trees it takes to make a forest (from a bird’s point of view) in suburban New York. Belaire, a natural resources manager and education and research coordinator at St. Edward’s University’s Wild Basin Creative Research Center in Austin, Tex., and her colleagues Lynne Westphal (USDA Forest Service) and Emily Minor (University of Illinois Chicago) asked people about their perceptions and awareness of birds in their neighborhoods and how they felt about having birds around their homes. They also asked about the yard design and management choices that residents make in both front and back yards. The researchers also looked at socioeconomic factors and used statistical analysis to tease out the relative importance on yard management choices of neighbors, factors like income, and perceptions of local birds. When planting and cultivating their front yards, people seemed most motivated by what their neighbors were doing. But in managing backyards, perceptions of birds became important to residents. This suggests that local birds may motivate stewardship. People enjoyment of and appreciation for birds appears to translate into on-the-ground effects, at least in backyards. Examples of front yards in Belaire and colleagues’ study area in the greater Chicago region. Belaire found a surprising 36 bird species living in or passing through the Chicago neighborhoods. In landscapes increasingly sublimated to human industry, parks and yards within cities are potentially essential habitat for local birds as well as oases for birds stopping by on long seasonal migrations. Belaire and colleagues want to know what motivates people in the design of their yards, and what yard elements matter the most to the birds. Models of her data indicated that the resources in groups of neighboring yards were, as clusters, more important for predicting the diversity and distribution of bird species than measurements of whole neighborhood, or landscape scale, tree cover. In Cook County, backyards with more trees, especially a mix of evergreen and broadleaf trees, more fruit and berries, and fewer outdoor cats had more native bird species. Bird feeders did not have an effect on the number and diversity of birds. Belaire said she and her colleagues were cheered by the excellent response rate to the survey and the overall enthusiasm of residents. The importance of yard-scale land management choices in boosting the presence of native bird species in urban areas was also encouraging for its implications for outreach programs. The efforts of individuals can make a difference and many people care about outcomes for birds. In the future, people may even be influenced by neighbors to make changes that could help birds thrive. Cook County, Ill. homeowners respond to survey questions about nature in their yards or neighborhoods. Courtesy, J. Amy Belaire. Friday, August 14, 2015: 9:00 AM, rm 347. COS 151-9 Avian diversity and abundance on a suburban university campus: Are trees enough to make a forest from a bird’s point of view? The 100th Annual Meeting of Ecological Society of America convenes this August 9–14 at the Baltimore Convention Center in Baltimore, Md. The centennial meeting is on track to be our biggest gathering, with 4,000 presentations scheduled on topics from microorganisms to global scale ecological change. ESA invites press and institutional public information officers to attend for free. To apply, please contact ESA Communications Officer Liza Lester directly at llester@esa.org. Walk-in registration will be available during the meeting. When polar bears (Ursus maritimus) meet glaucous gulls (Larus hyperboreaus) over the remains of a bowhead whale (Balaena mysticetus), they may be sharing more than a meal. As the warming climate brings animals into new proximity, parasites, viruses, and bacteria can find opportunities to spread to new and naïve hosts, sometimes jumping from birds to mammals, and from marine ecosystems to land ecosystems. Photo credit, USGS. When wild birds are a big part of your diet, opening a freshly shot bird to find worms squirming around under the skin is a disconcerting sight. That was exactly what Victoria Kotongan saw in October, 2012, when she set to cleaning two of four spruce grouse (Falcipennis canadensis) she had taken near her home in Unalakleet, on the northwest coast of Alaska. The next day, she shot four grouse and all four harbored the long, white worms. In two birds, the worms appeared to be emerging from the meat. Kotongan, worried about the health of the grouse and the potential risk to her community, reported the parasites to the Local Environmental Observer Network, which arranged to have the frozen bird carcasses sent to a lab for testing. 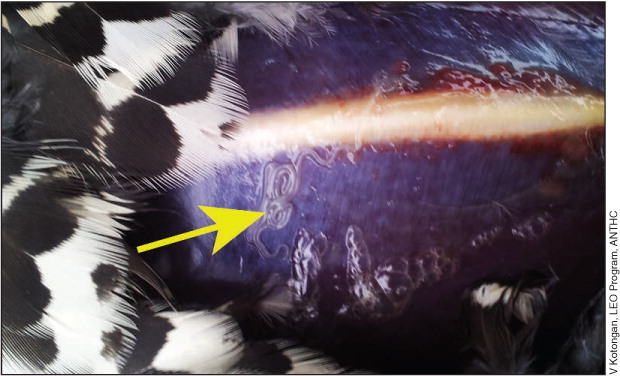 Lab results identified the worms as the nematode Splendidofilaria pectoralis, a thinly described parasite previously observed in blue grouse (Dendragapus obscurus pallidus) in interior British Columbia, Canada. The nematode had not been seen before so far north and west. Though S. pectoralis is unlikely to be dangerous to people, other emerging diseases in northern regions are not so innocuous. Animals are changing their seasonal movements and feeding patterns to cope with the changing climate, bringing into close contact species that rarely met in the past. Nowhere is this more apparent than the polar latitudes, where warming has been fastest and most dramatic. Red foxes are spreading north into arctic fox territory. 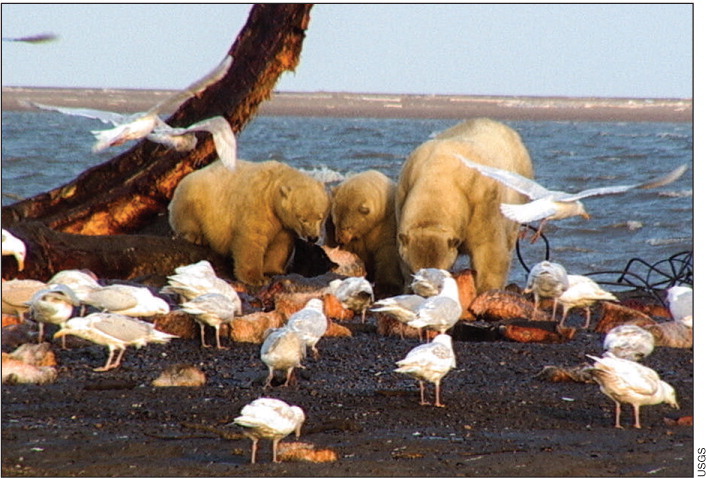 Hunger is driving polar bears ashore as sea ice shrinks. Many arctic birds undertake long migratory journeys and have the mobility to fly far beyond their historical ranges, or extend their stay in attractive feeding or nesting sites. With close contact comes a risk of infection with the exotic parasites and microorganisms carried by new neighbors, and so disease is finding new territory as well. Clement conditions extend the lifecycles of disease carrying insects, and disease-causing organisms. Migratory birds can take infectious agents for rides over great distances. In November 2013, Alaska Native residents of St. Lawrence Island, in the Bering Sea, alerted wildlife managers to the deaths of hundreds of crested auklets, thick-billed murres, northern fulmars and other seabirds, caused by an outbreak of highly contagious avian cholera (Pasteurella multocida). On a weekend in October, 2012, Victoria Kotongan shot six spruce grouse near her home in Unalakleet, on the remote northwest coast of Alaska. Four harbored visible worms under their skin, later identified as the nematode species Splendidofilaria pectoralis. Photo credit, Victoria Kotongan, Local Environmental Observer Network, Alaska Native Tribal Health Consortium. Circumstantial evidence collected by researchers and local observers is pointing toward a surge of infectious disease in the northern latitudes, but scanty baseline data makes interpretation of current trends uncertain. Van Hemert and colleagues review the state of our knowledge of emerging disease in northern birds and effects on wildlife and human health, discussing strategies for cooperative programs to fill in information gaps in the December issue of Frontiers in Ecology and the Environment. How does an elephant feel? What is the internal state of a cockroach? How does a raver’s past drug use linger in his hands? Accelerometers attached to animals can track not only location and motion but the animal’s internal state of health, hormones, and even emotions, moods, and motivations. The authors track specific components of internal state in three different animal models: chemical state in humans (Homo sapiens), affective state in African elephants (Loxodonta africana), and disease state in death’s head cockroaches (Blaberus craniifer). From the warm coral reefs to the cold waters under polar ice, tens of thousands of tracking devices send information about the underwater world and the animals that carry them. The authors lay out complex questions that new technology may allow us to answer. All ecosystems are affected by human activity. Patches of historical “wild” ecosystems remain, embedded in a matrix of cities and suburbs, agricultural lands and parks, and every gradient in between. The authors discuss a management framework that classifies a patche of land by how much it has changed, how its changes influence neighboring landscapes, and how likely a reversion to the historical state is. New ecosystems that coalesce under the influence of climate change, species invasions, and human industry also have ecological and cultural value, they say, which needs to be considered in restoration efforts. ESA is the world’s largest community of professional ecologists and a trusted source of ecological knowledge, committed to advancing the understanding of life on Earth. The 10,000 member Society publishes six journals and broadly shares ecological information through policy and media outreach and education initiatives. The Society’s Annual Meeting attracts over 3,000 attendees and features the most recent advances in ecological science. Visit the ESA website at . Datasets from long-running volunteer survey programs, calibrated with data from sporadic intensive monitoring efforts, have allowed ecologists to track the recovery of peregrine falcons in California and evaluate the effectiveness of a predictive model popular in the management of threatened species. An adult American peregrine falcon soars near her coastal nesting cliff in northern California, USA. Photo credit: Mary Malec. In recovery from the deadly legacy of DDT, American peregrine falcons (Falco peregrinus anatum) faced new uncertainty in 1992, when biologists proposed to stop rearing young birds in captivity and placing them in wild nests. Tim Wootton and Doug Bell published models that year in ESA’s journal Ecological Applications, projecting population trends for the falcon in California, with and without direct human intervention in the falcons’ reproductive lives. They concluded that the birds would continue to recover without captive rearing, though the population growth rate might slow. Fledgling introductions had bolstered wild falcon numbers and genetic diversity, but survival would ultimately depend on cleaning up lingering DDT contamination to create healthy conditions for wild birds, they argued. This month, they return to their 1992 predictions to see how the American peregrine falcons have fared over the last two decades, with a new report featured on the cover of the September 2014 issue of Ecological Applications. Though falcon numbers are lower than hoped for, data from volunteer survey programs, calibrated with more intensive surveys by wildlife biologists, confirmed a recovery trajectory well within the trends Wootton and Bell predicted. The follow-on study provided insights in the use of volunteer-generated data as well as an important test of population viability analysis, a tool increasingly used to evaluate alternative management plans and identify conservation priorities for endangered species, including sea turtles, grizzlies, and desert tortoises. It supported the importance of considering the health and behavior of geographic groups of a threatened species within a larger population. The 1992 paper identified falcon population “sinks” in parts of Southern California where chemical contamination lingered and the birds could not maintain numbers without migrants from healthier areas. Unfortunately, the falcon’s recovery has continued to lag in these areas. Once widespread across North America, the world’s fastest bird had disappeared from the east by mid-century and was near extinction on the continent by 1975, when a survey found only 159 breeding pairs of American peregrine falcons. Chicks often did not survive to hatch in thin shells made fragile by a metabolite of the famously persistent insecticide DDT, which, along with its metabolites and breakdown products, accumulates in fatty tissues and can haunt soils for decades. DDT came into use during World War II to prevent the spread of serious insect-borne disease. Its use expanded widely and indiscriminately over North America in the next three decades. Testimonials from scientists, like Rachel Carson’s Silent Spring, eventually brought attention to the environmental hazards of organochloride insecticides. Canada banned agricultural use of DDT in 1970, and the US followed in 1972. The peregrine was listed as endangered in 1970 under the original Endangered Species Conservation Act of 1969. 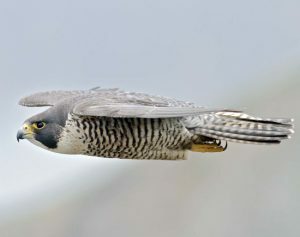 Peregrine numbers steadily improved in 1980s, and the US Fish and Wildlife Service removed the falcon from endangered species protection in 1999. Without parents to guide and protect them, released fledglings often ran afoul of owls and other dangers, but the captive breeding programs succeeded in boosting falcon numbers. How healthy released birds were, and what would happen when the flow of introduced young stopped, was unknown. “Our 1992 models suggested they would be okay,” said Wootton. To fill the large information gaps between the end of intensive falcon monitoring in 1992 and sporadic later surveys, Bell and Wootton drew on data collected by the Audubon Society’s long-running Christmas Bird Count and by the Breeding Bird Survey, administered cooperatively by the US Geological Survey’s Patuxent Wildlife Research Center and the Canadian Wildlife Service. They expected that the more formally structured Breeding Bird Survey would be most consistent with systematic census data collected by the Santa Cruz Predatory Bird Research Group during its captive rearing program (1975-1992) and in a 2006 follow-up census, and with 2003 data from the US Fish and Wildlife Service. The authors were a little surprised to discover that data from the Christmas Bird Count served better in this particular study. The Audubon Society has organized a yearly Christmas Bird Count since 1900, urging volunteers to count bird sightings over 24 hours in locations of their choice in mid-December to early January. Some participants have recorded feathered visitors to their backyard feeders while others hiked into local parks and wilderness preserves. The society has an interest is in getting people to participate and enjoy birding as well as gather data, and encourages first-time observers as well as scientists and life-long birders to join the count. To make year-to-year data more comparable, local groups return yearly to count birds in established spots, and often make efforts to assure that experienced birders accompany novices. Groups report results as birds sighted per hour per group. The Breeding Bird Survey has recruited birding enthusiasts who can identify all breeding bird species in their geographic area by sight and sound since 1966. Throughout the summer breeding season, dedicated volunteers record observations during explicitly defined 3-min observation sessions at 50 roadside stops along 40 kilometer routes. Wootton suspects that the greater number of ‘eyes on the skies’ in the Christmas Bird Count was key to obtaining a reliable sampling of the rare peregrines, overcoming variables of motivation, experience, location, and time. Predators like peregrine falcons are rare compared to other birds, even when populations are healthy. Mustering many observers lowers the likelihood of undercounting rare birds. Peregrine falcons that breed in California often do not migrate, which reduces the discordance of recording observations in different seasons. It is possible that for more common birds, or different ecological questions, the Breeding Bird Survey would perform better. Wootton noted that a reliable calibration data set was essential, though he has high confidence in the volunteer data. “I’m very positive about volunteer datasets. I think that comes from my background as a participant in other volunteer data collection programs going into university. I had a sense that people taking part in the programs knew what they were doing. That’s especially true in the birding world. Many non-scientists are very good at observing and identifying birds,” said Wootton. The Breeding Bird Survey, the Christmas Bird Count, and other citizen science programs like eBird are supported by strong communities of knowledgeable, competitive amateurs who provide learning resources to novices and create a culture of high expectations. Wootton speculated that these traits help produce high-quality data that can be integrated into research programs. Their success suggests to him ways in which the amiably competitive and obsessive nature of scuba diving, for example, might be harnessed to monitor coral reef health, and produce sorely needed natural history data. Population viability analyses are often used for planning conservation management, but management changes are rarely used to evaluate whether models are actually useful. Bell and Wooton would like to see predictions tested across wider situations to provide a rigorous test of model. But rigorous testing depends on long-term data collection. Ecologists are awakening to the potential of citizen naturalists armed with smartphones, databases, and social media tools to join them in that long term effort for conservation and discovery. Professor, University of Chicago, Chicago, Ill.
Wildlife Program Manager, East Bay Regional Park District, Oakland, Cal. Funding for this study was provided in part by the National Science Foundation (DEB 0919420). Journalists and public information officers can gain access to full texts of all ESA publications by contacting the public affairs office. Email Liza Lester, llester@esa.org. To subscribe to ESA press releases, contact Liza Lester at llester@esa.org. During commercial harvesting of brine shrimp eggs in Great Salt Lake, Utah, USA floating eggs aggregate with currents and harvesters concentrate eggs and vacuum them up. 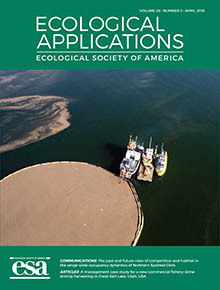 In the April 2019 issue of Ecological Applications, Belovsky and Perschon present at 20-year management study that developed a model ensuring abundant shrimp for both avian consumption and egg harvesting.